I made these cupcakes for our End of Season Soccer Party! I found the soccer cupcake liners at Walmart. For cakes, I always use Duncan Hines butter cake mix. To the dry mix, I add one small instant french vanilla pudding dry mix then make as directed (3 eggs, water, 1 stick butter). Next, bake as directed for cupcakes and let cool. For icing, I use Wilton's buttercream recipe. I change it up some when I am making white icing (see step 4 on the Wilton link) but for any colored icing, I follow this recipe. I made 24 cupcakes and 1 recipe of icing, which I tinted "leaf green". I spread a thin layer of icing on the cooled cupcakes. Next, I added green icing with Ateco tip #133 to make grass all over the cupcakes (instructions for grass technique HERE). 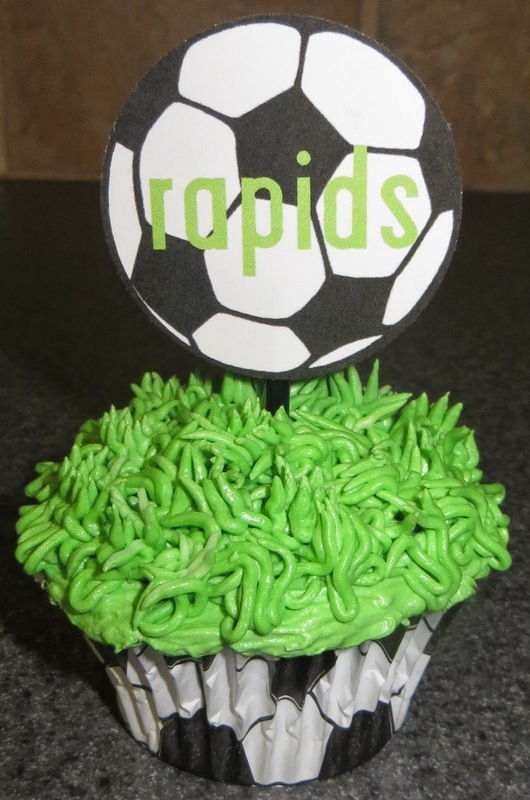 Top with Soccer Cupcake Toppers if desired (available for download HERE ). Print toppers on cardstock, punch with 2" circle punch, attach to halved coffee stirrers with tape, & insert into cupcake! Yummy!